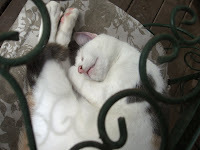 Even the B&B kitties love this rainy weather, just like a guest they take lots of “rainy day” naps. Come to think of it, they take lots of naps anyway. This is “Star” in her favorite nap spot on the garden room chair.